SAN RAMON, CA--(Marketwire - Oct 30, 2012) - Accela, Inc., the leading provider of mobile, web and cloud-based software exclusively for government, announced that the Accela Inspector™ mobile app for government inspectors and investigators is now available for Windows 8 and Windows RT, the latest versions of Microsoft's operating system. 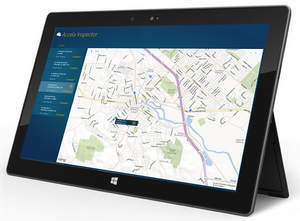 The Accela app can be used on all Windows 8 computers and tablets, including the new Microsoft tablet, Surface. "Accela is committed to providing our customers with choices that best suit their agency's infrastructure or individual preferences," said Maury Blackman, Accela President and CEO. "We believe that Windows Surface and Windows 8 with the Accela Inspector app provide a fantastic experience for our customers." Accela Mobile Inspector is part of the Platform4Gov, a framework for increasing government productivity and citizen engagement on top the company's foundational technology, Accela Automation®. Developing Accela Inspector for the Microsoft Surface tablet further extends the accessibility of Accela productivity apps to all major platforms, including iOS and Android. Learn more about how Accela Inspector helps government planning, permitting, and code enforcement agencies mobilize their workforce. The mobile app streamlines inspectors' work in the field and is cost-effective with regard to both hardware and software; it requires very little set-up and minimal training. Download the Accela Inspector app at the Windows Store. For more information, contact Accela today by phone at 888-722-2352, by e-mail at info@accela.com, or visit our Web site: www.accela.com. Accela, Inc. is the leading provider of mobile, web- and cloud-based software applications that make government easier, faster and more accessible for local, state and federal agency workers, and the citizens they serve. Accela is headquartered in San Ramon, Calif., with international offices in Australia and the United Arab Emirates. Additional information is available at www.accela.com. Accela and Accela Automation are registered trademarks of Accela, Inc. Accela Inspector is a trademark of Accela, Inc. Other names may be trademarks or registered trademarks of their respective companies.